Critical thinking skills may be one of the most important skill sets a child can learn in our information plagued society. Get your child thinking for themselves, and protecting themselves, with a strong critical mindset. Critical thinking is the ability to analyze information to establish it’s veracity or truth. In our rapidly changing technological world, more information is available at the touch of our fingers than we could ever need. The problem is that not all of that information is accurate and it can be very easy to get sucked into believing something. Facebook is a great place to see how few people employ critical thinking skills. How many times have you seen memes saying you could win money for sharing or that make statements masked as fact that are really opinion or badly researched information? It happens all the time. Teaching your child to question facts and seek more information is very important. In school kids are not always encouraged to take a critical mindset and question facts. I get it. There are a lot of kids in the classroom and only one teacher who has a huge list of stuff they need to get through. They simply can’t have all the kids questioning and challenging each fact. Even at home I struggle sometimes with my kids constantly challenging and asking questions, but this is an increasingly necessary skill. Gone are the days of believing something because a teacher said “I told you so” or having only an encyclopedia as your information resource. Teaching kids to mind numbingly follow directions leaves them open to many dangers. Kids need to learn to ask questions, to analyze information and recognize facts. If they learn to ask questions properly, which means asking the right questions to parse down to the facts, then they can filter through all the garbage and get to the truth. Facebook is a pretty mundane example of the lack of critical thinking skills, but what about those that fall victim to fraud? Knowing when not to believe those emails or phone scams claiming to be something urgent or important, is critical for protecting yourself. But how does someone know if it is real or not? 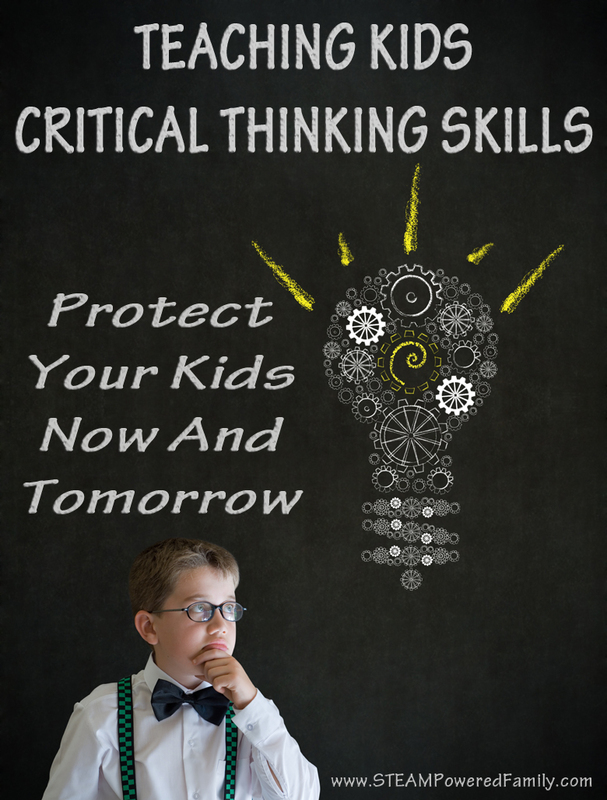 And how do we encourage our kids to be critical thinkers so they can protect themselves? The first step is to talk to your kids about fraudulent information and activities, from the hustlers looking to take advantage, to the well meaning, but uninformed friends. Teach them how to examine facts. Look for pieces that don’t make sense. No matter how convincing a person is in their presentation, teach your child how to follow their gut and look for weaknesses. Next pick up some kid friendly riddle books. Read them with your kids and practice solving them. This is a fun way to get your children analyzing information. Another great set of book is Mind Benders. They help kids learn how to analyze and sort information to solve puzzles. Play some board games that develop critical thinking skills, some of the best are ones you probably grew up playing. Clue, Mastermind and Battleship are all fantastic options. Share some memes with your children and talk about them. Do they seem real? How can you check to see if they are truth or fiction? Do some hunting for facts together. Go through the local paper. Read the articles. Look for clues that show some of the articles are actually ads trying to sell something. Check the facts and see if you can find some mistakes. Talk to your children about fraudulent schemes you’ve experienced yourself or that are in the news. It seems there is always something new happening and these scam artists are getting more sophisticated. I can’t imagine how they will be scamming when my children are adults, but at least I can educate them about the current red flags. Finally, encourage your children to ask questions and challenge statements to ensure their veracity and truth. I know it can be be hard when the questions seem never ending, but you really are arming your child so they can protect themselves. Developing a critical mindset is becoming one of the most important skills for success in our information saturated world. Arm your child, protect them, and teach them how to think critically while analyzing the world around them. Not only will it help them become successful, but it will also help protect them. Just like our parents always taught us to look both ways before crossing the street, teach your kids to question information before accepting them as fact.